Since the attempted coup in Turkey on 15 July 2016 almost 6,000 academics have been dismissed from their positions in the country, 15 universities have been shut down, and almost 70,000 students remain imprisoned as of the end of 2016, which accounts for one-third of the total number of prisoners in the whole country. These numbers are shocking and indicate a systematic attack on critical thinking in President Erdoğan’s “New Turkey”. 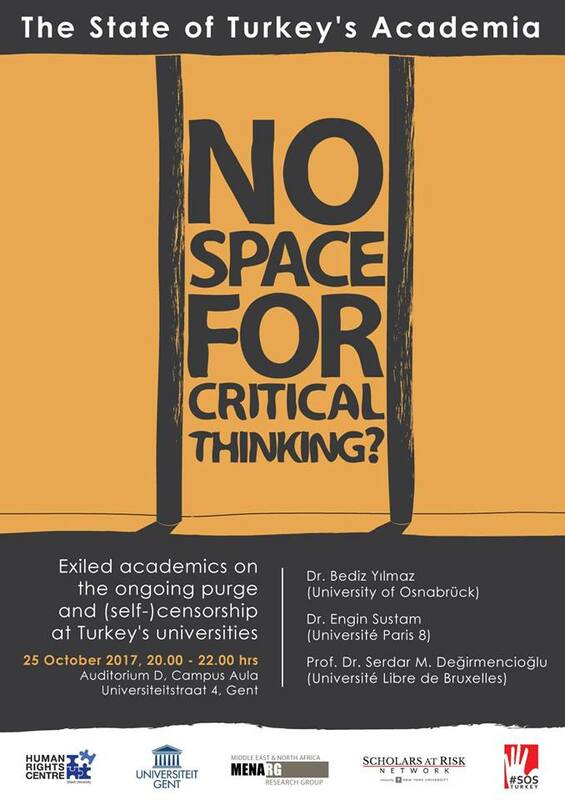 Three exiled academics from Turkey will speak about their personal experiences, point to the political logic behind the dismissals, and illustrate the climate that has made them possible. They will debate what the implications of the mass dismissals are not only for Turkey, but also for the wider region, the Middle East, and not Europe’s universities and democratic institutions. They will debate what the implications of the mass dismissals are not only for Turkey, but also for the wider region, the Middle East, and not Belgium’s universities and democratic institutions. Bediz Yılmaz graduated from the Department of Political and Administrative Sciences, Marmara University and received her PhD degree from the French Institute of Urban Studies (University of Paris VIII) with a dissertation on the multidimensional exclusion of forced migrants in a slum neighbourhood of Istanbul. Her research interests include forced migration, urban/rural poverty, spatial segregation, social exclusion, gender and social policies. After working for ten years as Assistant Professor in the University of Mersin (Turkey), she is currently Philipp Schwartz Fellow at Institute of Migration research and Intercultural Studies (IMIS) in University of Osnabrück, Germany. Engin Sustam is researcher in the social sciences, specialising on the Kurdish regions. His research touches on art theory, the production of minoritarian space, Kurdish Studies, post-colonial and subaltern studies, biopolitics, new forms of revolt, as well as violence and counter-violence. His book “Art et Subalternité Kurde: L’émergence d’un espace de production subjective et créative entre violence et résistance en Turquie” has been published by l’Harmattan in October 2016. He was teaching sociology and philosophy at Arel University and 29 Mayıs University in Istanbul until his dismissal. Currently he is visiting assistant professor (maître de conférences) at Université Paris 8 Saint Denis. Serdar M. Değirmencioğlu is a developmental psychologist by training, a community psychologist by commitment, and a practicing peace psychologist. He has served in children’s rights as well as in professional organizations as president, and is currently president-elect of the Society for Peace Psychology. He has produced ground-breaking books on young people’s participation, martyrdom and militarism, and private universities, and an award-winning documentary on the university entrance exam in Turkey. As an outspoken advocate of children’s rights, he writes a Sunday column focused on children’s issues in a daily newspaper. He was a professor at Doğuş University until April 2016 when was fired. He is now a visiting scholar at the Université Libre de Bruxelles.